Every Thanksgiving I remember the year Haley ate an entire turkey breast carcass. Yes, she ate the entire thing! That might have been the first time she discovered the joy of dumpster diving in the kitchen trash can. With all the commotion around the holiday, I had forgotten about the bones in the trash can when we left the house for a while. When we returned home, I was shocked to see the overturned trash can but shock soon turned into panic when I discovered one tiny turkey bone left on the floor and I realized Haley had eaten the rest of the carcass. 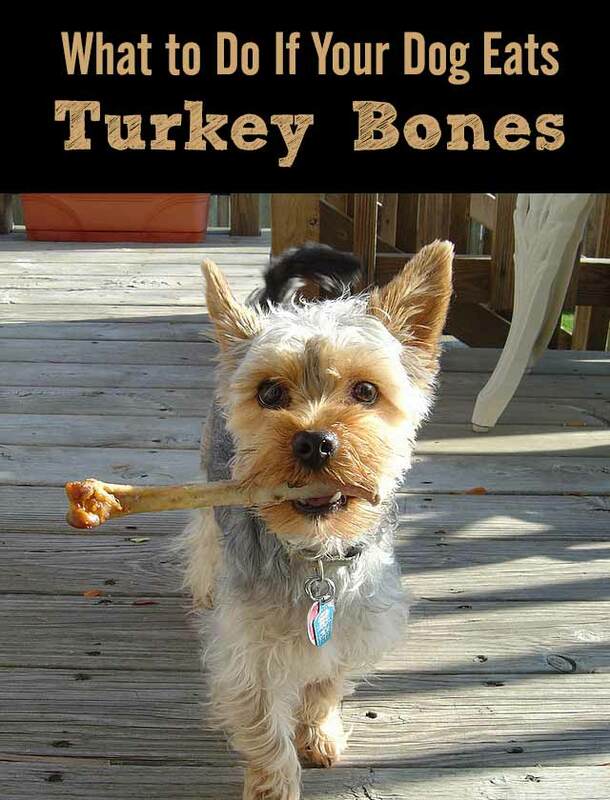 I was so mad at myself for not safely disposing the bones because I knew dogs should never have cooked bones, especially chicken or turkey bones. Those tiny cooked bones become very brittle and can easily splinter. Dogs can choke on the bones or they can become lodged in their throats or puncture their stomach or digestive tract. Surely, eating an entire turkey breast carcass couldn’t be good news for Haley and because it was a holiday our vet’s office was closed. After a phone consultation with an emergency vet, here’s what they advised. Although there’s a potential for the bones to cause a serious problem, dogs have strong stomach acid to help digest the bones and most dogs will pass them without medical assistance. It’s better to let the bones pass through your dog’s digestive system, rather than risk a choking hazard or throat injury when they try to expel them by vomiting. If your dog is breathing fine and seems to be acting normally, mostly likely all the bones passed through to the stomach without incidence. If your dog’s choking, gagging, retching, drinking a lot of water, licking their lips, pacing anxiously or is unable to sit or lie down comfortably, call or visit your vet immediately. Foods such as bread slices or cooked rice can help cushion the bones as they pass through the digestive system and may help them pass easier. We fed Haley bread slices, but check with your vet for recommendations for your dog. It takes about 72 hours for the bones to digest and pass, so it’s important to monitor your dog and their stools during this time period. You may noticed bones in their stool if they didn’t digest completely. Call or visit your vet right away if your dog has any of these symptoms: Difficulty passing stool, black or bloody stools, vomiting, loss of appetite, diarrhea, lethargy, abdominal pain, anxiousness or abnormal behavior. Until the bones pass, avoid overly-strenuous exercise, excessive jumping or rough play. This is what our local emergency vet recommended for Haley, but you know your dog best. As with any medical issue, never hesitate to contact your vet if you’re worried or concerned. Thankfully, Haley didn’t have any problems after her Thanksgiving feast. Whew! The bones passed just fine and I think they mostly digested because her stools didn’t look dramatically different afterwards. Maybe the wishbone she ate brought us some good luck that year. Besides properly securing the trash, here are a couple of other tips to keep your pup safe this Thanksgiving. Watch the fatty table scraps which can cause pancreatitis and be sure your dog doesn’t eat unbaked bread dough. The yeast in the dough will cause it to swell in their abdomen and the yeast and sugar can combine and cause alcohol poisoning. If you’re curious, here are some other foods your dog shouldn’t eat. Haley and I hope you and your pups have a wonderful and safe Thanksgiving! Haha! No worries about that bread dough.? Have a wonderful Thanksgiving! Thank you for these tips. I have a big boy who gets into EVERYTHING. We try to keep trash and food secured, but if you forget one thing somewhere he’ll find it (he can reach to the back of the kitchen counters)Even with being safe, I love having this kind of information on hand, just in case. Thanks so much, Heather! That would be a challenge with a large dog that loves to snack. I’ve heard of dogs that will open refrigerators and locked cabinets, yikes! I guess we should be glad our pups aren’t that determined, haha! 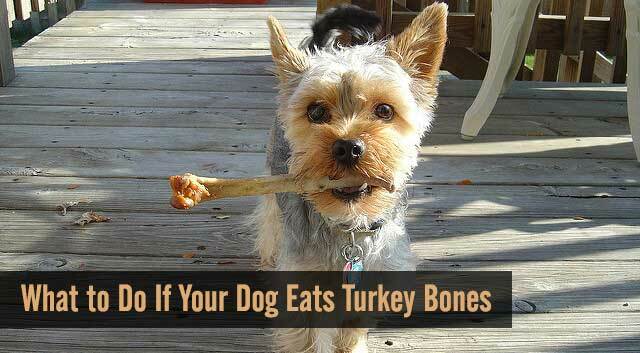 Great tips, hopefully all the furry ones will be safe this turkey day. Have a great Holiday. Wishing you guys and the Chessies a wonderful Thanksgiving, JoAnn! ? That can be scary!! Several years ago we learned our Tank had eaten a whole bag of Hersey kisses WITH the wrappers still on them. We were looking for the bag and couldn’t find them then a few days later we were looking under the bed and found the empty bag. It was not even opened yet and it was over a pound of it. SCARED me!! But he was completely fine!! I felt bad because I didn’t know about it when it happened. That is why we call Tank our pup whose belly is made of steel. That must have made for some festival yard decor the next day, lol! I’m glad Tank was fine afterwards. A friend of ours had a chocolate lab named Hershey that once ate one of those giant Hershey bars with wrapper and he was fine too. Good thing for Tank and Hershey they were milk chocolates and not dark chocolate. Have a great Thanksgiving! I’m glad everything worked out all right! Dogs really test our ability to think ahead and clean up after ourselves don’t they?! Oh yes, they sure do. It’s almost always me that screws up, lol! I so shared this post! Great tips, Elaine. Cooked bones can be scary for sure. I’m glad that Haley was ok. Happy Thanksgiving! Thanks for sharing, Barbara! I hope you guys, Buzz and Missy have the best Thanksgiving ever! ? Good to know! Will definitely share. I won’t be cooking a turkey this year – it’s only Doodle Dad and I so we’ll make due with something less time consuming and taxing. Can we trade places, Cathy? Haha! Sometimes the peaceful, low-key holidays can really be nice too. Enjoy! You must have been terrified! I’m happy to say that my two don’t do much dumpster diving. But the young, almost a kitten little guy in the house certainly might try. That sweet kitten of yours really sounds like he keeps everyone on their toes, lol. Have a great Thanksgiving, Jean! Now that Turkey Day is past – and we had hamburgers and chips which were not shared with the girls – we can relax. But I always have to keep an eye on the dog daddy to be sure he doesn’t sneak them any table scraps. Lol! Yes, I have those in our family that I need to keep an eye on too. Haley always gains a pound or two when the kids are home for the holidays. Thanks for the info. 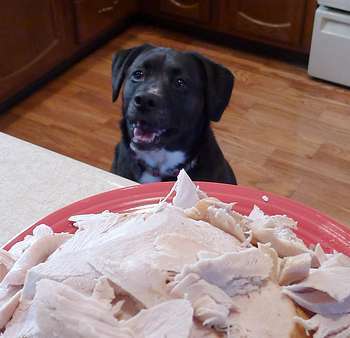 My dog just ate the turkey off the countertop. Someone told me to feed them pumpkin to help the bones pass. Sh**! I own a Havanese Poodle, he’s 10 pounds and is 18 weeks old. He has a very large bone which he alwYs likes to chew on and as Thanksgiving just passes I gave him a treat of a turkey leg bone to chew on. I was monitoring him and after a few minutes I noticed he had chewed the top of the bone right off! I’m so mad at myself but very worried! It’s going to be an anxious few days now! Ozzy must of got into garage. He threw up shattered bones day after 10 tiny splitterd Bones. Didn’t pick up immeitly he ate again. Now he’s chocking. Vomiting, gagging.